This past winter was a season of loss in our household. Nadia, our silky calico (Turkish Angoran) was sick for a very short time in December and passed away at the Vet’s office after they had tired a number of things to try to turn her condition around. She was about 10 and a half by then, which, by some standards, is already a “mature” cat. However, with her two “sisters” aged over 17 years, we were not ready to lose Nadia so soon. Her passing cast a gloom over our holiday season. Then at the end of December, the Friday before the New Year’s weekend, my Mother choked while eating lunch at her assisted living facility, she aspirated, stopped breathing and coded while on the way in to the hospital. CPR was performed and my Mom was brought back, but it was the beginning of the end. Mom had dementia. She was at the point in the disease where we were looking to move her to a skilled nursing facility when this happened. On January 3rd she passed away at Hershey Medical Center. Gradually as we put more time between us and this past winter, the mood was not so somber any longer. The days grew longer and with Spring, came a feeling of hopefulness. Then came summer, then as we were approaching fall…then kittens. 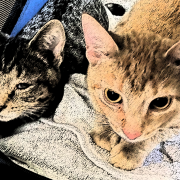 Within a couple of weeks of arriving in our house, our FREE kittens both developed conjunctivitis and some kind of upper respiratory infection, Journey showed the signs first. That eye she had been favoring turned “goopy” and she developed a cough that was bad enough we couldn’t ignore it. So off to the veterinarian she went for diagnosis and medication ($$$). Nutmeg followed within a few days ($$$). Into quarantine they went, living in our bathroom and getting eye drops and antibiotics ($$$). Our young girls overcame their ailments and quarantine was lifted. We settled back into a more regular routine. We made a rather futile effort to keep the kittens from eating the old cat kibble and the old cats from eating the kitten kibble. They all had “downstairs time” on the evenings and weekends. During the day everyone lived “happily” in our bedroom/bathroom. They two sets of cats seemed mostly to ignore one another. I had worried that the older cats would get bullied, or get angry and “protest” having to share their domain. Thankfully, those things never happened. Isis seemed to be more “demanding” than before, but we sometimes wondered if her hearing was going, perhaps she could not hear how unbelievably loud her vocalizing had become. Xena was still wanting to be lifted up for her night time routine in bed next to me. Looking back over the past few months, the days have just come and gone so quickly. I can’t peg exactly when I knew we were reaching the end with Xena. She was fading slowly at first. Then, in the period of about 48 hours she went from fading to not eating, to peeing on the cat bed, to gone. The other cats didn’t seem very affected by this. I had placed Xena in the bathroom when it was clear she was on her way out. She was lying on a towel, covered by another towel. I was sitting on the floor next to her, just stroking her, crying, not ready to lose her. In prances Journey who comes right up to Xena and sniffs her, then goes about her kitten business. It was a Saturday in September. At some point I decided I couldn’t just lay there waiting for her to die, watching her every breath, feeling her pulse. I went outside and started to mow the yard. I was more than halfway through when Michael came out and tapped me on the shoulder. Xena was gone. He had already made her a “box.” We wrapped her in a shawl my Mom had crocheted. I drew on the inside lid of her box and we sealed it up and buried her in the back of the yard by our Forsythia bush. During the next several weeks, we were busy getting the house presentable as my aunt was paying us a visit from the Netherlands. I’ve always found that company is a good incentive for housework. I couldn’t tell if the other cats missed Xena or not. I missed her snuggles at night time. We had out visit from my aunt and Isis was the belle of the ball. As was her MO, she greeted my aunt and spent much time in her lap. The new kittens were still in their shy mode and hid under our bed upstairs. The visit came and went. The weather got cooler. The kittens got bigger. Isis became more vocal, demanding attention. She slept a lot, but was still social, spending time with us downstairs each evening until mid-October. We recognized the signs of her fading away having just been through it with Xena. She suddenly did not eat the wet kibble with gusto. She spent more time under the small accent table in the living room than on the chair or in my lap. Her voice changed. She was still eating, drinking and carrying on with her ADLs until the final 48 hours of her life. Two nights before she passed, she spent time on my pillow during the night. She was still jumping from the floor, to the bed, to the nightstand, to the dresser. The next day, she was mostly sleeping and the day after that, she wasn’t moving off of her pillow on the floor, even though there was water and food right there for her. I hung out on the floor with her knowing it was the end and just wanting it to go quickly for her…and for me. She passed during the day when we were at work. And then, there were two. Isis’ passing didn’t seem to impact the kittens at all. They sniffed where she had been, but that was about as much attention as they gave the matter. There was life to be lived. As time has passed, Journey and Nutmeg have taken over some of the duties of our old girls. Journey is the social one. She is not shy, but she hasn’t quite settled into the “cuddler” role that Isis had. Nutmeg is the larger shy one, frequently found sleeping under the bed. She comes up at night and sleeps on our feet. They don’t have free run of the house yet as we have caught Journey hanging from the bird cage one too many times. Their kitten-ness is a wonderful distraction from the sadness of losing our longtime pets. Its hard to be sad when your kitten has just dropped their favorite nippy mouse at your feet wanting to play “Get Mouse” with you, or when the two of them follow you into the bathroom each morning wanting cuddles and mommy time while you get ready for work. Their manner is so joyful, embracing what each new day has to bring. In May when I first entertained the notion of adding to our “herd” of cats, I would not have imagined our household pet situation progressing as it did. Looking back, I’m glad we brought the kittens into our lives. It has been chaotic and bittersweet, stressful, but rewarding. There is nothing quite so precious as holding a warm purring kitten in your lap, to hear that purr-box turn on and then fade out as she falls asleep. And even though getting two of them was not originally part of the plan, watching the two of them play together, it was the absolute right thing to do.